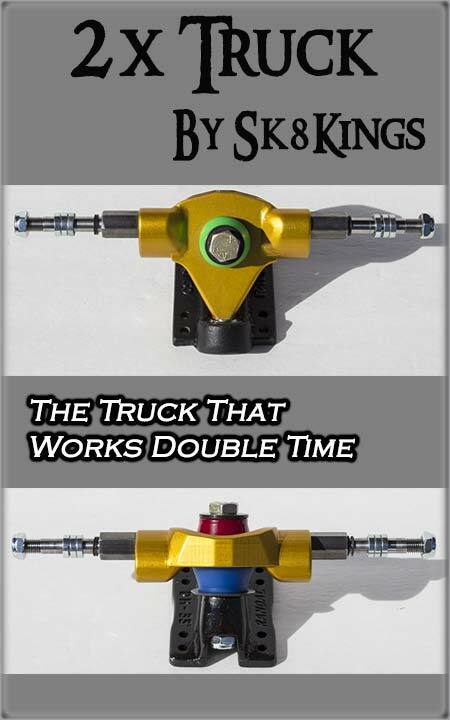 The Sk8Kings 2X -- is an excellent performance truck -- that works double-time. With this super versatile truck solution -- the hanger works for either front or back by moving the axle location (double-tapped) and pairing with the appropriate degree baseplate. The 2X hanger features a spherical bearing, post pivot, and comes outfitted with screw-in extra long 8mm axles (easily changed or replaced). Designed with Randal-compatible geometry the 2X hanger mates with various degree baseplates to suit specific riding purposes. The axle system offers .25" shoulder size for a hanger width of 4" minimum (101.6 mm) and 4.75" maximum (120.65 mm). Course thread screw in style design offers easy replacement as needed and a generous 1 5/8" axle shaft for plenty of wheel spacing versatility with the included axle spacers. Axle shaft is 8mm and designed to work with standard thread/size 5/16 axle lock nuts and 8mm wheel bearings. Available set-up options: 50 degree baseplate with spherical pivot for front turny truck, 35 degree baseplate with spherical pivot for rear stable truck. Matched up with Randal baseplates - which we've completely overhauled -- upgraded with super-strong aircraft grade AN bolt kingpin & nut, spherical bearing pivot, custom premium grade bushings (Riptide or Reflex) and washer hardware. Sold individually for front or rear -- for a complete skateboard - order one of each. Comes with premium grade bushing combos customized for rider weight and noted discipline - please specify intended discipline when ordering.